TANF is a federal block grant that provides low-income families with a minimal economic safety net. For a state to receive federal TANF funding, its revenue must be invested in programs that support education and job training, child care, income assistance, and other programs that support low-income families. The Center for Budget and Policy Priorities data show that 68 out of 100 families living in poverty in 1996 received TANF funding to help meet basic needs. In 2011, only 27 out of every 100 families living in poverty received this crucial financial assistance, a drop of more than 50%. TANF is often the only source of financial income for those who live in poverty, so it is a desperately needed program for many low-income families. As a method of limiting the financial impact of recessions on low-income families, the federal government will typically provide some contingency funding to help states pay for increased enrollment in TANF-related programs. Consequently, Wisconsin has received additional TANF federal funding that is specifically designated to assist low-income families. Wisconsin TANF programs and services for 2013-2015 biennium include: Wisconsin Works (W-2), burial services, child welfare prevention services, Children First, domestic violence services, Earned Income Tax Credit, educational support services to needy students, kinship care, and student meal programs. The 2013-2015 budget diverted $27 million annually of TANF funding (on top of the 2011-2013 budget’s $37 million annual shift) to pay for the Earned income Tax Credit (EITC). This totals $128 million of TANF funds used to pay for the EITC in order to free up General Purpose Revenue (GPR) for other purposes. According to the Wisconsin Budget Project, this increased use of TANF funding for the EITC has resulted in significant cuts to other TANF-funded programs such as W-2 and Wisconsin Shares. The proposed budget funds current TANF programs including W-2, Wisconsin Shares child care subsidies, Transform Milwaukee and transitional jobs, grants to the Boys and Girls Club and Wisconsin Community Services, the Earned Income Tax Credit, and other services for needy families. These funding estimates are based on reauthorized federal contingency funds of $50 million over the biennium. The budget continues to fund the EITC in part by transferring funding from the TANF block grant. The JFC continued to expand the portion of the EITC funded from the TANF block, by a total of $12 million total over the next biennium. They also made many other minor changes, the most notable being a decrease in funding for childcare subsidies and W-2 benefits. The Legislature approved the Governor's proposed TANF budget as amended by the Joint Committee on Finance. By continuing to fund TANF programs like W-2 and Wisconsin Shares, the budget helps provide at least some minimal supports for working women in Wisconsin. 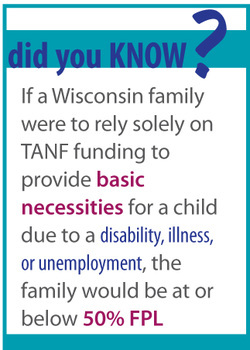 TANF-funded programs supported 25,862 Wisconsin households in 2012. These programs are essential for providing a minimum of economic security for low-income Wisconsin women and their families.